We’re excited to introduce our new e-newsletter! With this format, you can easily view the images sent in by your fellow COASSTers either in the message itself or in your web browser. You’ll also be able to manage your subscription (see link at the bottom). As this is the very first edition in this format, please let us know if you have any feedback. In the past few weeks, we’ve had reports of Common Murres in Oregon with signs of avian pox. While rare (perhaps 1-5% of carcasses), this is something to note in the bird comments field if found. We asked Dr. Julia Burco, Wildlife Veterinarian for Oregon Department of Fish and Wildlife some frequently asked questions about avian pox. Let us know if you have any other questions. Q: What does avian pox look like? Q: Is avian pox transmittable to humans? A: No, this is not a virus that can affect humans. Q: How do I document avian pox? A: Take additional photos of the face/legs in cases where pox is suspected, note in the COMMENTS section for that bird. We hope that you’re all enjoying the start of the fall season! 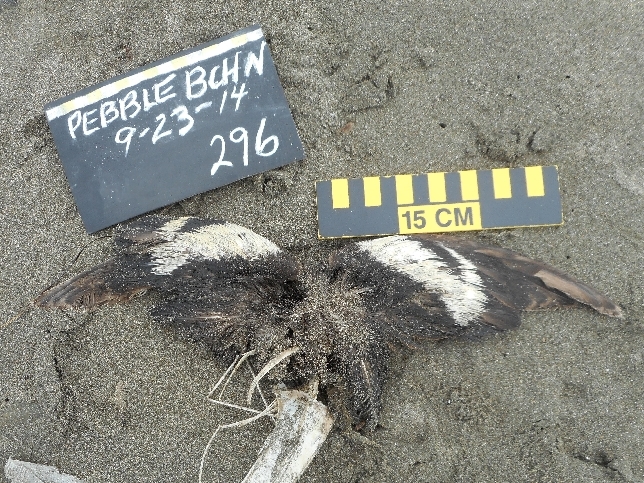 This bird was found on September 3 at Hippy Cove in Alaska by Pat and Susan. The bill is pale and hooked with a dark tip, and we don’t have a good view of the foot – let’s use the wing. 3) Emperor Goose (no species page in guide, but bill is hooked, so let’s take this out of the running). Large Immature Gull – specifically Glaucous-winged Gull, subadult (light brown mottled feathers mixed with gray, wing tips gray). 2) Large Immature Gull (LA3) –that’s correct. Specifically a Glaucous-winged Gull, subadult (light brown mottled feathers mixed with gray, wing tips gray). 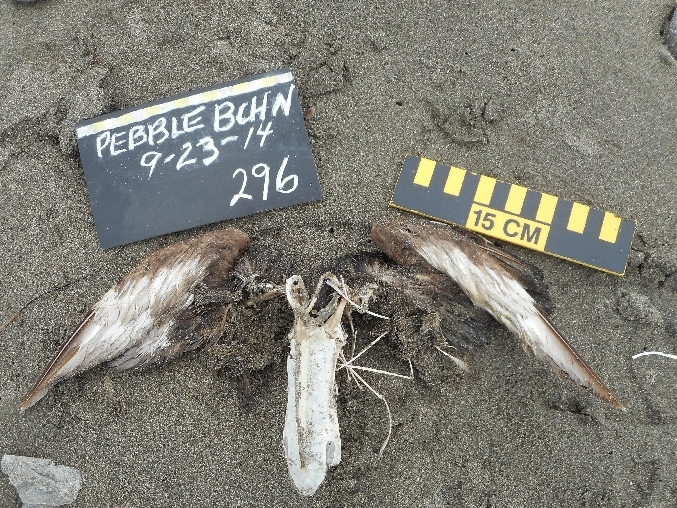 This bird was found on September 23 on North Pebble Beach in California by Melissa. West coast wing key (page 33): choose white patch(es) (go to Q19), check location – it’s on the mantle – Pigeon Guillemot, AL10. West coast wing table (page 32): select “small” row and “patch/speculum” column, which leaves us with: PIGU (AL10) or GWTE (WF7). Green-winged Teal has a green speculum, no patch, so Pigeon Guillemot it is! 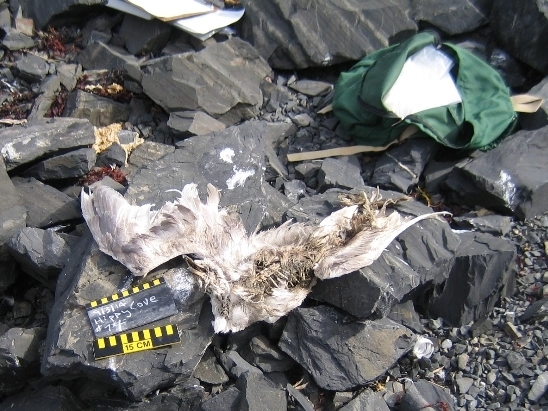 Alaska wing key (page 44): choose “w/ light or dark speculum and/or one of more white patches” (go to Q17), white patch(es), no speculum (go to Q21), underwing linings light gray to dark (go to Q22), one large patch on mantle – Pigeon Guillemot, AL7. Gooseneck barnacles (Lepas spp.) 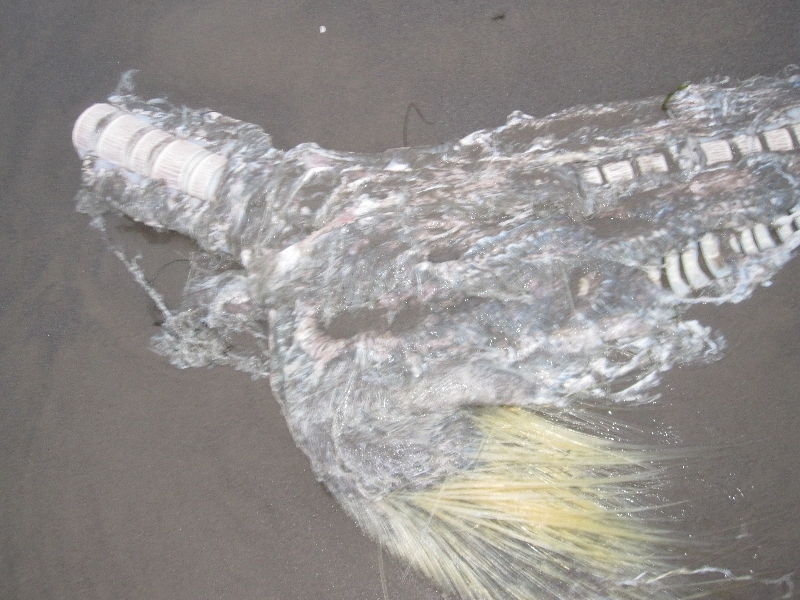 are associated with marine debris that floats in the open ocean. This type of biofouling can indicate how long an object has been in the water and provides clues to where it may have come from. 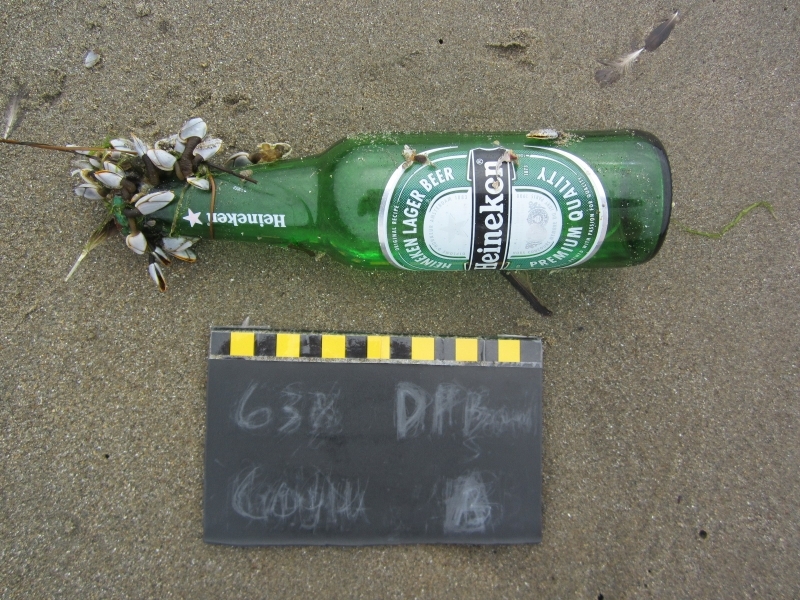 Barnacles also tell us something about the fate of plastic in the ocean. Research by Miriam Goldstein (UC San Diego-Scripps Institution of Oceanography) and Deborah Goodwin (Sea Education Association) found that 33.5% of Gooseneck barnacles on debris found in the North Pacific Subtropical Gyre had plastic particles in their digestive tracts. 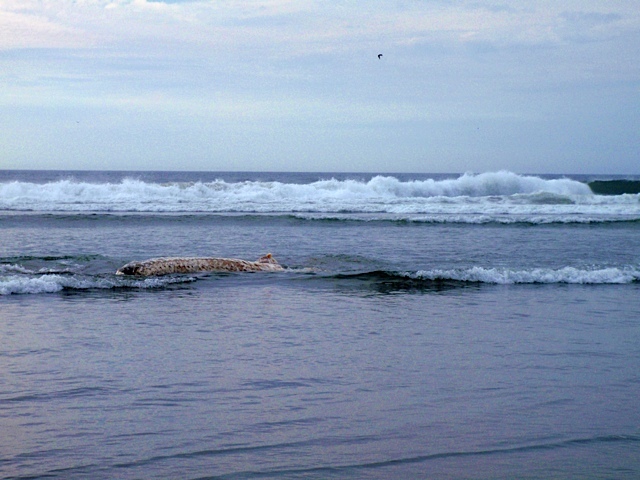 Tiny dorsal (back) fin, mottled skin, white gill rakers (filter-feeding function, like baleen) – turns out this is a basking shark, confirmed by Oregon Marine Mammal Stranding Network Coordinator Jim Rice. This entry was posted in Uncategorized and tagged avian pox information, biofouling, Marine Debris, Pigeon Guillemot on 8. October 2014 by coasst.